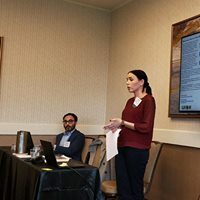 TOHA would like to thank TOHA board member Shelby Gonzales of Texas A&M University-Corpus Christi and Mark Goldberg of University of Houston for sharing their oral history work during the Texas State Historical Association’s 123rd Annual Meeting in beautiful (but colder than usual) Corpus Christi, Texas. 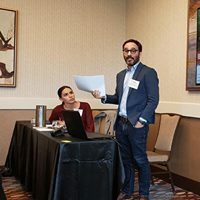 Our TOHA-TSHA joint session was titled "In the Wake of Harvey" and explored different ways in which their programs are documenting stories and experiences from individuals affected by Hurricane Harvey. There was a great discussion about choosing interviewees and sustaining projects such as these. 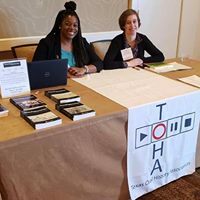 Also, thank you to everyone who stopped by the TOHA table in the Exhibition Hall. Secretary-Treasurer Adrienne Cain, President Abra Schnur, and TOHA Life Member Stephen Sloan (not pictured) were on hand to ask questions, encourage membership, and share news about our upcoming conference this April in Austin. Next year's TSHA meeting will be held February 27-29, at the AT&T Executive Education and Conference Center in Austin, TX.